The second generation LaserMethane mini Gen2 from Crowcon is changing the way methane leaks can be detected. Utilising laser technology, LaserMethane mini Gen2 (LMm) allows users to reliably and accurately detect methane, at a safe distance. Get results in seconds by simply pointing the laser beam towards the suspected leak, or along the survey line. This removes the need to access fenced-off, high level or other hard to reach areas. 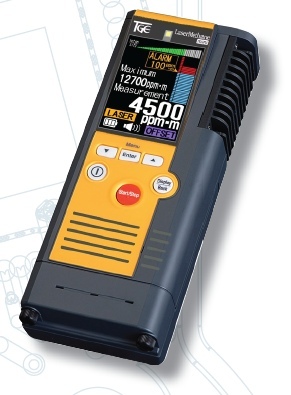 Crowcon's LaserMethane mini Gen2 can accurately and reliably detect gas leaks from a distance. What was once a time and resource consuming activity can now be completed in seconds. Measurement Principle - By pointing the LaserMethane mini Gen2 at a suspected leak or survey area, such as a gas pipe or ceiling, the concentration of methane is measured by detecting the difference between the light emitted and the light received. In order to achieve high detection sensitivity and selectivity for methane, LaserMethane mini Gen2 uses a wavelength that both exhibits maximum adsorption and is unique to methane. The methane column density is the concentration of methane between the detector and the target and is the product of the concentration of the methane cloud (ppm.m) and path length through the cloud (metres) and is reported in units of ppm.m.